NEW YORK, N.Y. (June 15, 2017) – The New York Chapter of the Public Relations Society of America (PRSA-NY) recognized Padilla with six 2017 Big Apple Awards, including being named the Best of the Best for its Niagara Conservation campaign, #WhatTheFlush: Disrupting the Water Conservation Conversation. 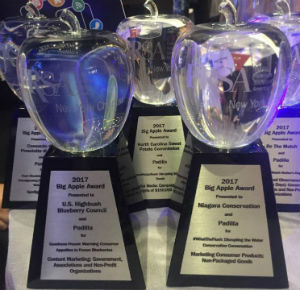 In addition, Padilla took home a Big Apple Award for its work with Niagara Conservation in the Marketing Consumer Products: Non-Packaged Goods category. Earlier this year, Padilla earned multiple awards for its work with Niagara Conservation, including a Silver Anvil Award presented by the Public Relations Society of America, a Gold SABRE Award and North America In2SABRE Award given by The Holmes Report, and two PRWeek Honorable Mention Awards. More information about the #WhatTheFlush campaign, including the video case story, can be found on PadillaCo.com. The 2017 Big Apple Awards took place Monday, June 12 at the Grand Hyatt New York. The awards honor public relations campaigns implemented in and around New York City and are considered one of the highest honors in the industry. More than 60 judges reviewed more than 160 entries, selecting close to 70 campaigns and spotlight award entries for recognition. View the complete list of 2017 Big Apple Award Winners at PRSANY.org.